Jelly Belly's finest traditional fruit flavours all in one box. 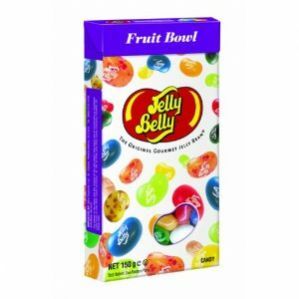 Jelly Belly Jelly Beans Fruit Bowl Mix 150g. If your feeling fruity this box of Jelly Belly's finest traditional fruit flavour jelly beans all in one box is just for you. For the Jelly Belly aficionado - no other gourmet beans will do. Flavours: Tangerine, Green Apple, Blueberry, Coconut, Very Cherry, Lemon, Red Apple, Watermelon, Plum, Raspberry, Peach, Juicy Pear, Pink Grapefruit, Grape, Top Banana, Lemon Lime. ingredients: sugar, glucose syrup, modified corn starch, grape juice concentrate, peach puree concentrate, raspberry puree, banana puree, acidity regulators: E270, E296, E297, E325, E330, E331; plum juice concentrate, natural and artificial flavours, apple juice concentrate, glazing agents: E901, E903, E904; lemon puree, coconut, colours: E100, E102, E110, E129, E132, E133, E150d, E171; tangerine juice concentrate, grapefruit juice concentrate, ascorbic acid, tapioca dextrin. suitable for vegetarians. kosher. gluten free, fat free, gelatine free. manufactured in a factory that processes nuts.